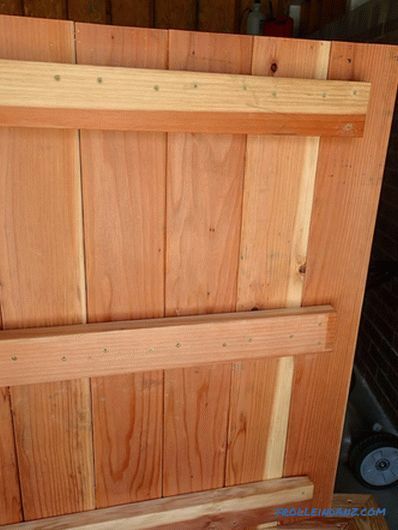 First , what it takes to take care, while embarking on a similar project, of course, lumber. I decided to use redwood. 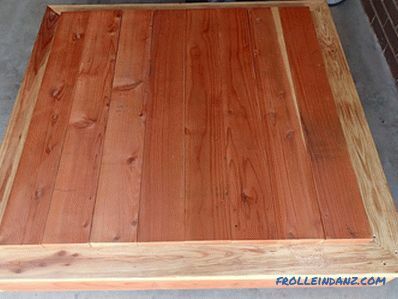 So, you bought the materials and tools, it is time to learn how to make a children's sandbox. 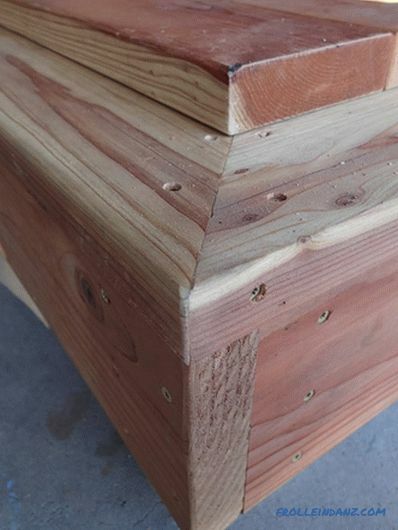 To begin work with the construction of the box. Saw a 10x10 cm block into four equal parts (25 cm long). 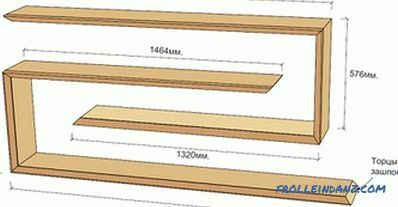 From boards of 5x20 cm, cut two fragments 120 cm long and two 110 cm long (you can, of course, just cut both boards in half, resulting in 4 pieces 120 cm long, but then the sandbox will turn out not quite square - not 120x120, but 120x130 cm) . 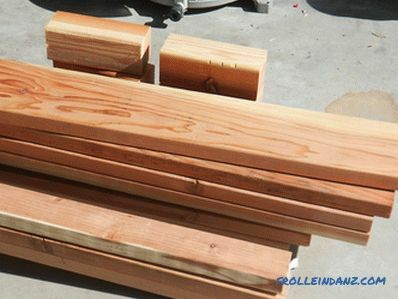 The rest of the lumber you will do later. 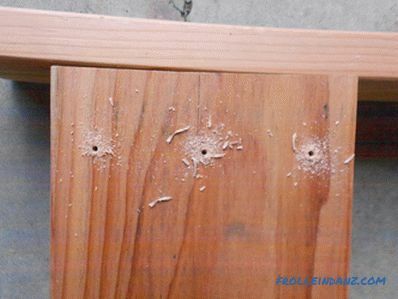 At both ends of all boards of 5x20 cm in size, prepared for making sides of the sandbox, drill three guide holes for the subsequent screwing of the self-tapping screws. 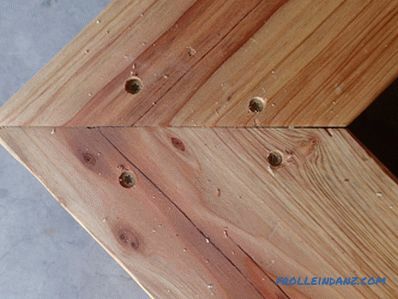 Connect the boards together and assemble the box to fix the boards in the corners, use pre-prepared pieces of 10x10 cm bars. 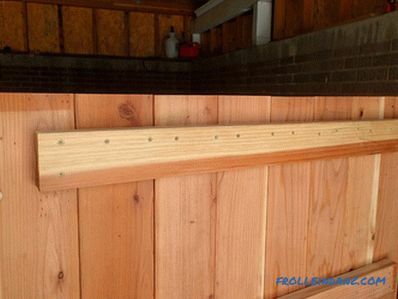 First, screw the bars to the two boards with self-tapping screws out of four. Then fasten the box elements together with self-tapping screws. Now it is time to create a bench around the perimeter of the sandbox. 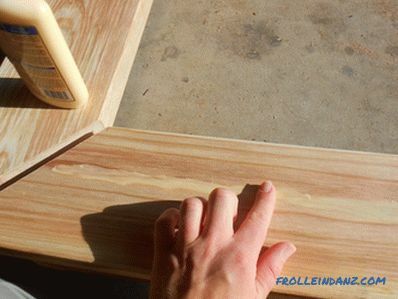 To do this, you will need four boards with a section of 5 * 15 cm, the ends of which need to be cut at a 45 ° angle. 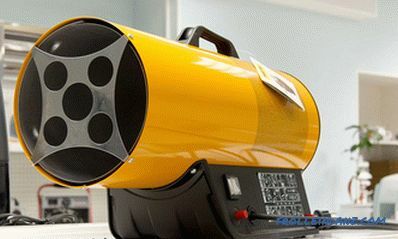 The long side of the trapezoid should be slightly larger than the external length of the duct wall (theoretically, 120 cm, but it is better to measure, since in practice there may be slight deviations). 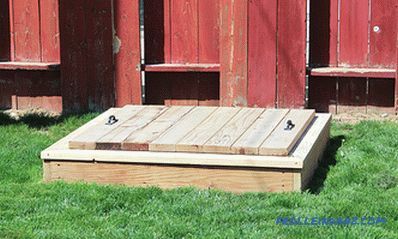 When you put in place all four boards prepared in this way, your sandbox should look like in the photo. 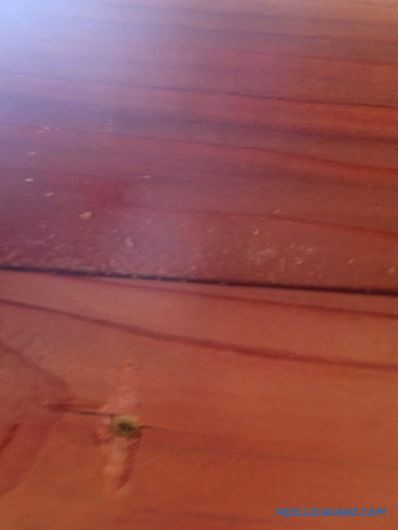 Then I filled the gaps between the boards with wood glue and polished the surfaces. However, it would be better if you do this work a little later. Now it is necessary to fix the bench on the sandbox box. First, 9 cm with self-tapping screws, fasten the seat boards to each other, pre-drilling the guide holes. 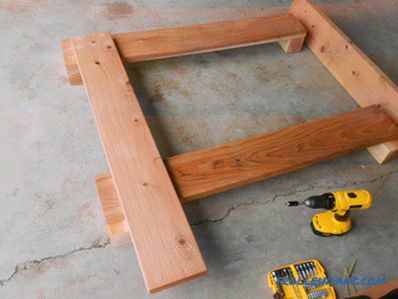 Then attach the bench to the sides of the sandbox. 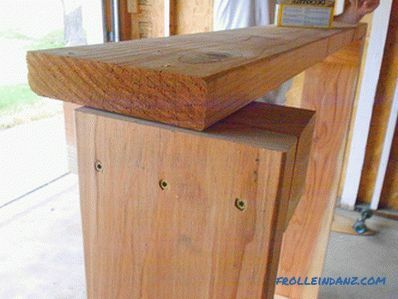 To do this, in each end of the boards making up the benches it is necessary to screw in two 9 cm screws. 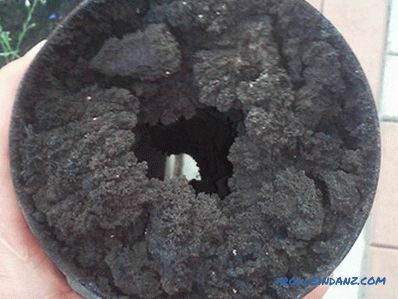 Make sure that they do not go into the "milk": one screw should connect the seat with the side wall of the box, the second - with the corner bar. 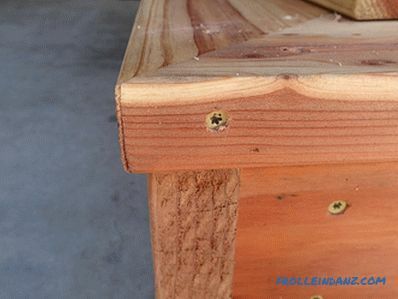 You can increase the reliability of the connection between the bench and the box by fastening the side walls with the seat boards with several 6 cm self-tapping screws, twisted from the inside at an angle. 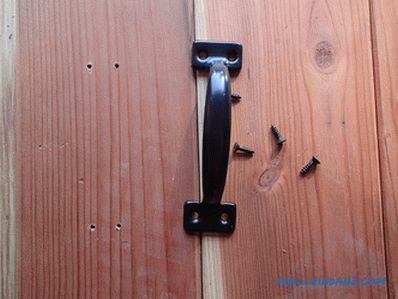 When doing this, make sure that the ends of the screws do not stick out, passing the bench board through. Cut the boards to fit the size of the cover. I would not like to give exact dimensions here, you yourself have to decide how much the lid should cover your sandbox (but not less than 2. 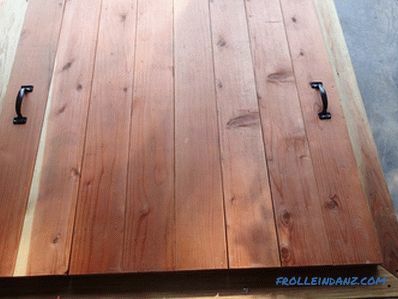 5 cm from each edge), and, guided by this, choose the boards of the right size. For example, I used eight boards with section 2. 5 * 15 cm. Place the prepared boards in a row. Perpendicular to them, place three boards 2. 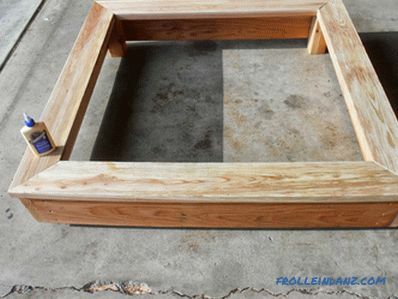 5 * 10 cm (make sure that the cross-beams will fit well into the inner part of the sandbox) and fasten them with 4 cm screws to each board cover. Sand with sandpaper and all edges and surfaces. 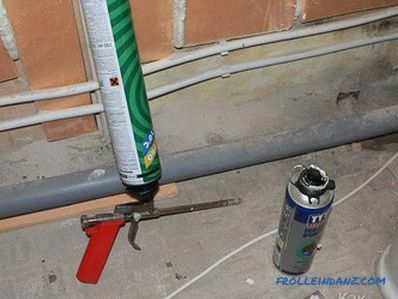 Now is the time to cover wooden surfaces with waterproofing agent. I applied two coats of Thompson's WaterSeal Multi-Surface Waterproofer. It remains only to fasten a pair of handles on the cover. 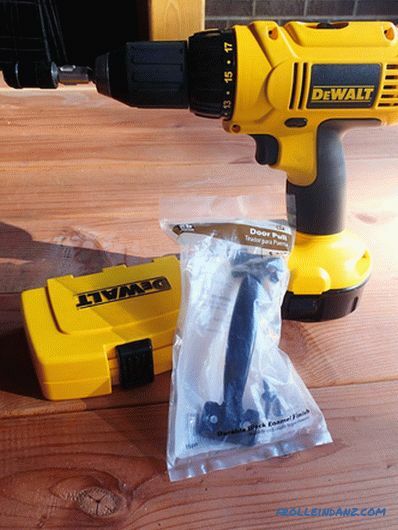 To fix the handles, drill holes that match the size of your screws (the diameter of the hole should be slightly less than the diameter of the screw). Screw the knobs together and the lid can now be easily raised and lowered. For greater convenience, it is best to fasten two handles. In the last photo there is a ready sandbox located in the space allocated to it. .. It remains to fall asleep in her sand, and around to plant grass. 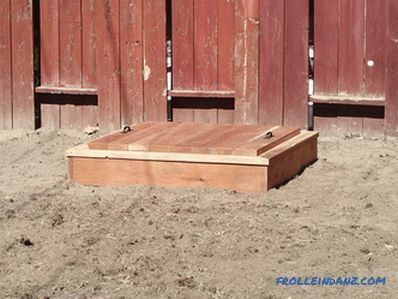 Now you also know how to make a sandbox with your own hands, which means you can also make your children happy.